Tottenham will continue playing games at Wembley until the end of this year. Their new 62,000-seat arena was supposed to open on 15 September but safety concerns led to a delay. Chairman Daniel Levy said: "In light of factors completely outside of our control, contractors missing deadlines and possible future unforeseen issues, we are naturally being cautious. "All home games will be played at Wembley Stadium up to and including the game against Wolves on 29 December." 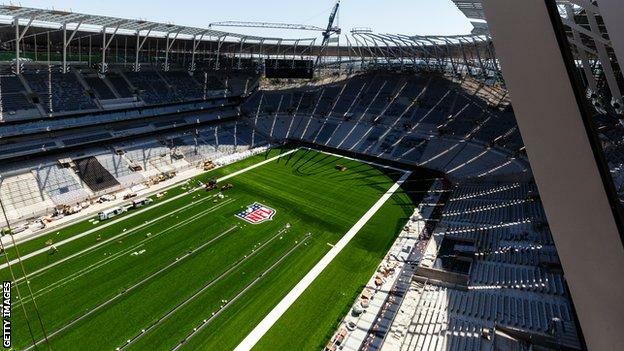 Adding that the delay was an "immense disappointment", Levy said: "There isn't an hour that goes by when I am not asked when we will be able to stage our first game at our new home. "I wish I was able to confirm an exact opening date and fixture. "Whilst we are conscious of the need to keep pressure on our contractors to deliver as soon as possible, we are also acutely aware of how difficult the lack of clarity is for our supporters." 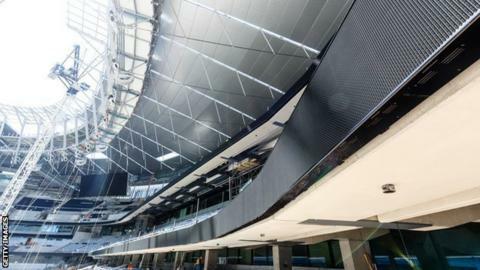 Stating that he hoped the completed stadium would be "one of the finest in the world", Levy said the delay had made it possible to bring some aspects of the project forward. "We have not stood still whilst work on the critical safety systems has been happening," he said. "The delay in the stadium opening has made it possible for some track and station improvements to be brought forward due to the fact that previously non-available construction dates have become available for works." Another update on the stadium's development is expected in December. In September, Tottenham manager Mauricio Pochettino said he would "help to finish the stadium" and was confident it would be finished this year. "Maybe one or two months means a lot but in the end it is no time because the most important thing is to finish and in the future have a venue that is going to help us win trophies," he added.